There have been songs sung and devotionals written about this passage. However, most of the time the context is represented incorrectly. The psalmist was not thinking about the beautiful mountains and then describing God’s help. Instead, the psalmist was looking at the mountains and seeing the “high places” of the false religions mentioned multiple times int he Old Testament. There is a town in India that illustrates this well, Gudibande. This town sits at the base of a large hill and on top of the hill there is a temple dedicated to the Hindu goddess Shiva. 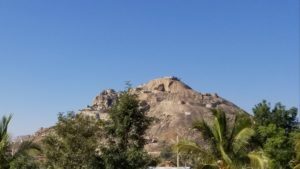 Gudibande is a compound word meaning “temple stone.” The temple has been there for thousands of years, and now there is a fort surrounding the temple was built around the middle ages. This temple can be seen for miles. The people will take curd, milk, honey, ash, bananas, or other items and hike to the top of the hill. Once to the top they will offer these items as sacrifice to Shiva. They will do this to appease her and to progress on their spiritual journey. If you are a Christian you might shudder at the thought of climbing a hill with an offering and offering it to God in order to appease him. We might not physically climb a hill, but in many ways we live the principle out. We live on a pendulum of trying to figure out if God is angry or pleased with us. If things are going wrong I better go to church. I better make God happy. Maybe I could give a little more. Maybe I could attend another Bible study. Perhaps I should pray a little more. I better make sure I receive communion. Perhaps I should get baptized again? Sure, we would never say this out loud, but our actions would show that this is what believe in our heart of hearts. If we just do a few more spiritual things it will make God happy and he will move his attention away from us. Doesn’t he have better thing to do anyway? Being part of a church, studying scripture, giving sacrificially, praying more are certainly not bad. Studies show these things result in a better quality of life even if a person doesn’t believe in God. However, if we are doing things out of obligation, out of religious duty to earn favor with God they become a burden that is too heavy to carry. This usually goes in one of two ways. The burden of religious duty becomes too great and a person gives up on God, in which case their is no anchor for the soul. The person becomes adrift and they become a slave to their emotions, whichever the waves of life will take them. They other option is to pretend. This person only shows the the things that look good, wearing the right clothes and saying the right things. Everything looks good on the outside but inside they are dying. They begin to loose feeling for life. Jesus offered a better way. Instead of climbing a hill to reach God, God came down. Instead of making an offering to God, God became our offering. Jesus offered a better way. As Christians we no longer have to try and earn our place. Because God came to us and offered himself for us we can have confidence in God’s love for us. Thanks Laurie! It was an amazing trip! Thank you Jesus for reconciling us. So thankful I do not climb a hill and offer my stuff to a pagan god because of your shed blood on the cross. God bless you Pastor Mike as you work for our Lord in India. I will be praying for you. Yes, praise God we live by grace!